Welcome to the fifth installment of "Xorro-Q in 7 Bites". 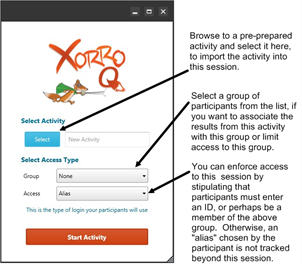 By now you've probably already tried using Xorro-Q in live audience settings. In this page we'll be discussing some of the special ways in which Q can add more value than you might have experienced the first (or second) time through. Choices before Launching your Live (Real-Time) Activity Your participants are filing into the room. You might be preparing to run a spontaneous session using Instant Activities, or you might have prepared a series of questions or question batches. Either way: You can start your activity either from a browser (using your QF site), or using the Q-Launcher off your desktop. The Q-Launcher is ideal where you're wanting to easily interact with other desktop applications, e.g a slide show, mind-mapping solution etc. Otherwise, the functionality is very similar. 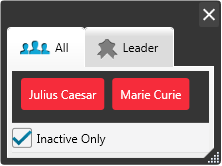 To run your activity from QF, just select it (activities tab) and hit the "Run" button. If using Q-Launcher, once you've logged in, select the activity immediately after logging in. This is when you should be confirming who's allowed to participate, and how your participants will be identifying themselves, by selecting the "Group" and "Login Type". If you don't choose a group, the Results from this activity and associated participation logs will not be reported in association with any group (or course). On the other hand, choose a group and not only can these statistics win meaning, but you also have the opportunity to restrict access to only members of that Group (choose "Group Only" as the Login Type). The other login types, "Alias Only" and "ID or Alias", are self-explanatory. As per previous articles: having your participants use ID to login has a number of distinct advantages. Most notably, their contributions are tracked to the same "person" across multiple activities. Also, should a participant log out inadvertently in mid-activity, they'll be guaranteed of re-entering where they left off if they can re-enter using an ID. Batches & Queueing your Questions If your activity has batches, these will appear, along with single questions, in the storyboard at the foot of the Q-Launcher Question Panel (or at the foot for the QF Running Page). These will be arrayed as they are ordered in the original activity. However, you do not need to actually launch these in this order, and you can choose to launch some questions or batches, and skip others. To launch a batch (or question), just select it from the storyboard, and select "Ask". Show Results - or not? The Facilitator is always in control of when (or whether) to display the Results of a question to the audience. There are two situations to consider: the display of Results on the Facilitator's screen, and the feedback given to individual participants following their responses. In some circumstances (notably Team Based Learning processes) it is appropriate to suppress feedback to individual participants during and at the end of an activity. Otherwise in most cases providing feedback to participants is generally preferred by most Facilitators. Select to suppress feedback in the activity launch options. 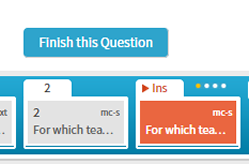 After asking a question, the Facilitator can choose to display Results from the question simply by pressing the "Results" button. This will display the Result from any question already asked, in place of the question body. To Stop, or not to Stop (a Question) Just as when choosing to display Results, a Facilitator can choose when to Stop the current question. Stopping the question means that participants can no longer submit responses. 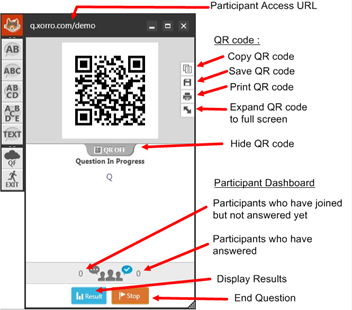 In some cases you might prefer to display Results while the question is still running: in this case participants will still have the opportunity to respond to the question after or while viewing the contributions of other participants. This approach is commonly used in creative or brainstorming settings where shared contributions can lead to a chain reaction of further contributions. In other settings it is more common to not display Results until the question is closed to responses. In this case, "Stop" or "Finish" the running Question (or batch) before pressing "Results" to view the responses. Re-asking a Question Any question, once asked, can easily be "re-asked": just select the question from the storyboard and select "Re-ask". This has the benefit of preserving the Results from the second asking, separately from those to the first. Coming up: In the sixth installment of "Xorro-Q in 7 Bites" you'll be introduced to Q-Bank. As your utilisation of Xorro-Q rises, you'll need to start sharing your activities and your questions. You'll quickly discover the value of being able to organise your questions separately to activities in which the questions are used.... and of being able to search for questions shared by other facilitators. You already know how to read ahead!